CVT detects the vehicle driving status from switches, sensors and signals, and controls the vehicle so that the optimum shift position and shift timing may always be achieved. It also controls the vehicle to reduce shift and lockup shock, etc. If a malfunction occurs on the electric system, activate the fail-safe mode only to drive the vehicle. *: If these input/output signals show errors, TCM activates the fail-safe function. TCM has a fail-safe mode. The mode functions so that operation can be continued even if the signal circuit of the main electronically controlled input/output parts is damaged. 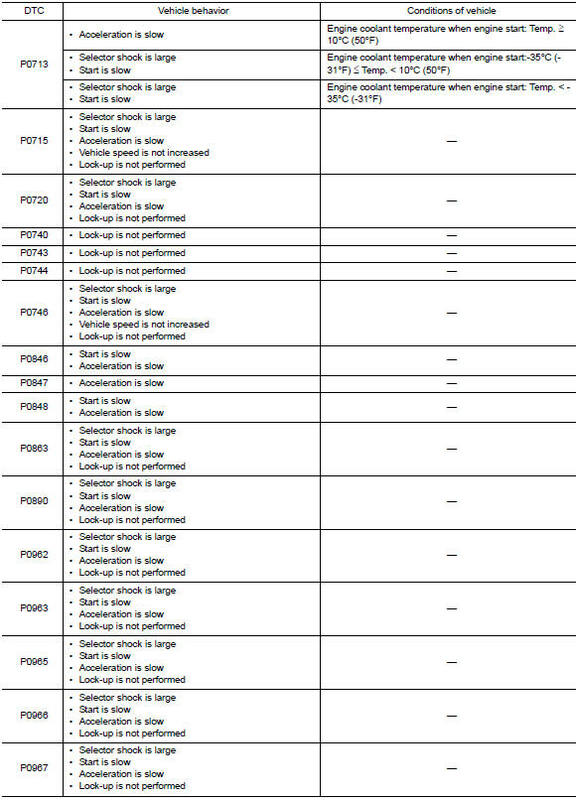 If the vehicle shows following behaviors including вЂњpoor accelerationвЂќ, a malfunction of the applicable system is detected by TCM and the vehicle may be in a fail-safe mode. At this time, check the DTC code and perform inspection and repair according to the malfunction diagnosis procedures. The TCM becomes the protection control status temporarily to protect the safety when the safety of TCM and transmission is lost. It automatically returns to the normal status if the safety is secured. The TCM has the following protection control. Control When a wheel spin is detected, the engine output and gear ratio are limited and the line pressure is increased. At the 1GR, the clutch pressure is increased. 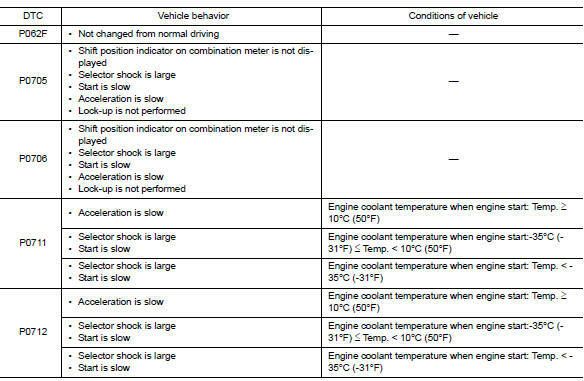 Vehicle behavior in control If the accelerator is kept depressing during wheel spin, the engine revolution and vehicle speed are limited to a certain degree. From the 1GR, upshift to a certain gear ratio is only allowed. Normal return condition Wheel spin convergence returns the control to the normal control. Control When the CVT fluid temperature is high, the gear shift permission maximum revolution and the maximum torque are reduced than usual to prevent increase of the oil temperature. 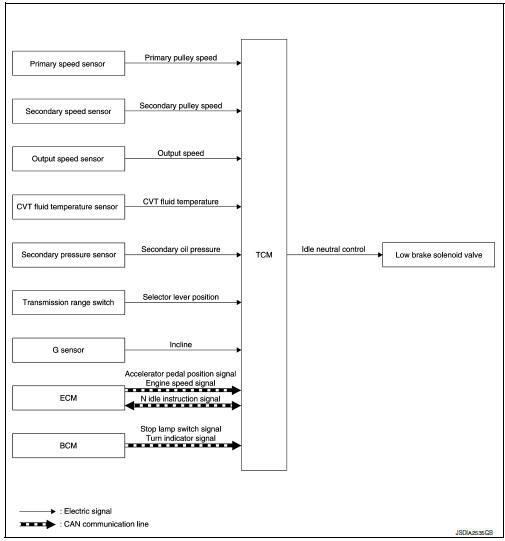 Vehicle behavior in control Power performance may be lowered, compared to normal control. Normal return condition The control returns to the normal control when CVT fluid temperature is lowered. 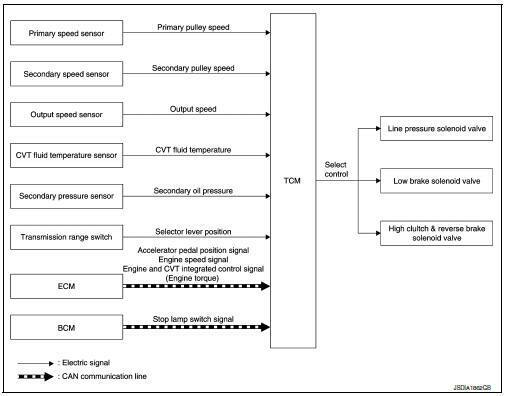 Control Engine output is controlled according to a vehicle speed while reversing the vehicle. Vehicle behavior in control Power performance may be lowered while reversing the vehicle. Normal return condition Torque returns to normal by positioning the selector lever in a range other than вЂњRвЂќ position. Control The reverse brake is controlled to avoid becoming engaged when the selector lever is set in вЂњRвЂќ position while driving in forward direction at more than the specified speed. Vehicle behavior in control If the selector lever is put at вЂњRвЂќ position when driving with the forward gear, the gear becomes neutral, not reverse. Highly accurate line pressure control (secondary pressure control) reduces friction for improvement of fuel economy. 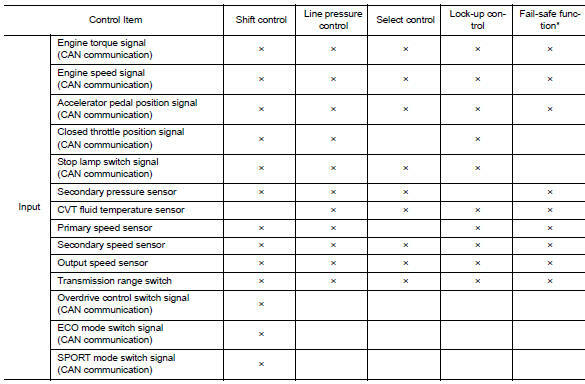 Appropriate line pressure (secondary pressure) suitable for driving condition are determined based on the accelerator pedal position, engine speed, primary pulley (input) speed, secondary pulley (output) speed, vehicle speed, input torque, stop lamp switch signal, transmission range switch signal, lock-up signal, power voltage, target shift ratio, oil temperature and oil pressure. 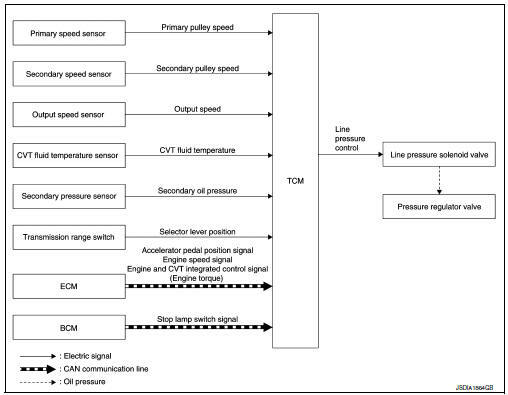 In normal oil pressure control and oil pressure control in shifting, highly accurate secondary pressure is determined by detecting the secondary pressure using an oil pressure sensor and by feedback control. To select the gear ratio that can give the driving force to meet driver's intent or vehicle situation, the vehicle driving condition such as vehicle speed or accelerator pedal position is detected and the most appropriate gear ratio is selected and the shifting method before reaching the speed is determined. The information is output to the primary pressure solenoid valve to control the line pressure input/output to the primary pulley, to determine the primary pulley (movable pulley) position and to control the gear position. D Position (OD ON) Gear shifting is performed in all shifting ranges from the lowest to the highest gear ratio. The gear ratio is generally high by limiting the shifting range on the high side, and this always generates a large driving power. By limiting the shifting range only to the lowest of the gear ratio, a large driving force and engine brake are obtained. If a downhill is detected with the accelerator pedal is released, the system performs downshift to increase the engine brake force so that vehicle may not be accelerated more than necessary. If a climbing hill is detected, the system improves the acceleration performance in re-acceleration by limiting the gear shift range on the high side. For engine brake control on a downhill, the control can be stopped with CONSULT. From change of the vehicle speed or accelerator pedal position, the acceleration request level of the driver or driving scene is evaluated. In start or acceleration during driving, the gear shift characteristics with linearity of revolution increase and vehicle speed increase are gained to improve the acceleration feel. Based on accelerator pedal angle, engine speed, primary pulley speed, and the secondary pulley speed, the optimum operating pressure is set to reduce impact of a selector lever operation while shifting from вЂњNвЂќ (вЂњPвЂќ) to вЂњDвЂќ (вЂњRвЂќ) position. Controls for improvement of the transmission efficiency by engaging the torque converter clutch in the torque converter and eliminating slip of the converter. Achieves comfortable driving with slip control of the torque converter clutch. The oil pressure feed circuit for the torque converter clutch piston chamber is connected to the torque converter clutch control valve. The torque converter clutch control valve is switched by the torque converter clutch solenoid valve with the signal from TCM. This controls the oil pressure circuit, which is supplied to the torque converter clutch piston chamber, to the release side or engagement side. If the CVT fluid temperature is low or the vehicle is in fail-safe mode due to malfunction, lock-up control is prohibited. In lock-up engagement, the torque converter clutch solenoid valve makes the torque converter clutch control valve locked up to generate the lock-up apply pressure. This pushes the torque converter clutch piston for engagement. In lock-up release, the torque converter clutch solenoid valve makes the torque converter clutch control valve non-locked up to drain the lock-up apply pressure. This does not engage the torque converter clutch piston. If a driver has no intention of starting the vehicle in D position, TCM operates the low brake solenoid valve and controls the oil pressure of the low brake to be low pressure. Therefore, the low brake is in the release (slip) status and the power transmission route of transaxle is the same status as the N position. In this way, the transaxle is in idling status and load to the engine can be reduced to improve fuel economy. Idle neutral control is started when all of the following conditions are fulfilled. However, during idle neutral control, idle neutral control is stopped when any of the following conditions is not met. 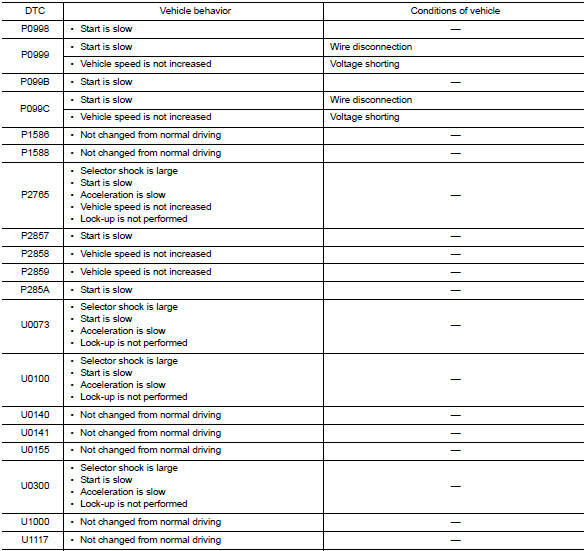 Stops or prohibits the idle neutral control when the TCM and ECM detect that the vehicle is in one of the following conditions. Engine coolant temperature and CVT fluid temperature are the specified temperature or more, or the specified temperature or less. When a transaxle malfunction occurs. When idle speed increases due to heavy electric load*. *: When any one of rear window defogger switch, A/C switch, headlamp, fog lamp is turned ON. In addition, when the steering wheel is operated. When the idle neutral control finishes, if the vehicle is driven at more than the specified speed and the idle neutral control start conditions are satisfied, the idle neutral control starts again. If the vehicle has a malfunction, the idle neutral control does not start. When the selector lever is at вЂњLвЂќ position. When the selector lever is at D position and overdrive is OFF. For details on ECO mode control, refer to DMS-26, "ECO MODE CONTROL : System Description". If a malfunction occurs in the system of CVT during ECO mode, the ECO mode indicator lamp turns OFF and the control switches to the normal mode control. Driving mode that keeps high engine revolution and provides direct feel and acceleration performance suitable for driving on winding road. For details on SPORT mode control, refer to DMS-63, "SPORT MODE CONTROL : System Description". 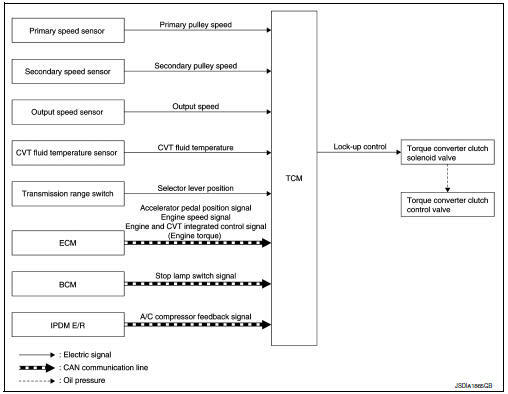 If a malfunction occurs in the system of CVT during SPORT mode, the SPORT mode indicator lamp turns OFF and the control switches to the normal mode control. 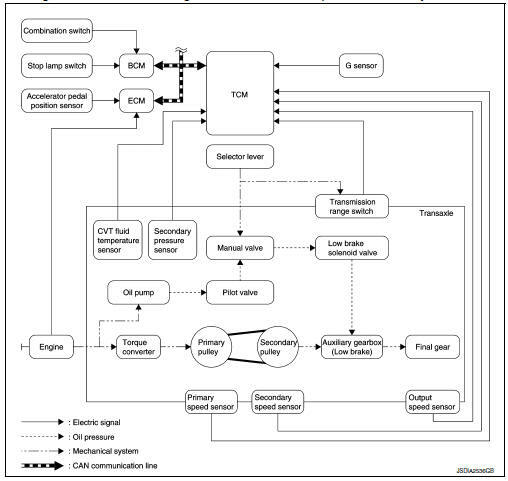 This is an onboard diagnosis system which records diagnosis information related to the exhaust gases. It detects malfunctions related to sensors and actuators. The malfunctions are indicated by means of the malfunction indicator lamp (MIL) and are stored as DTC in the ECU memory. 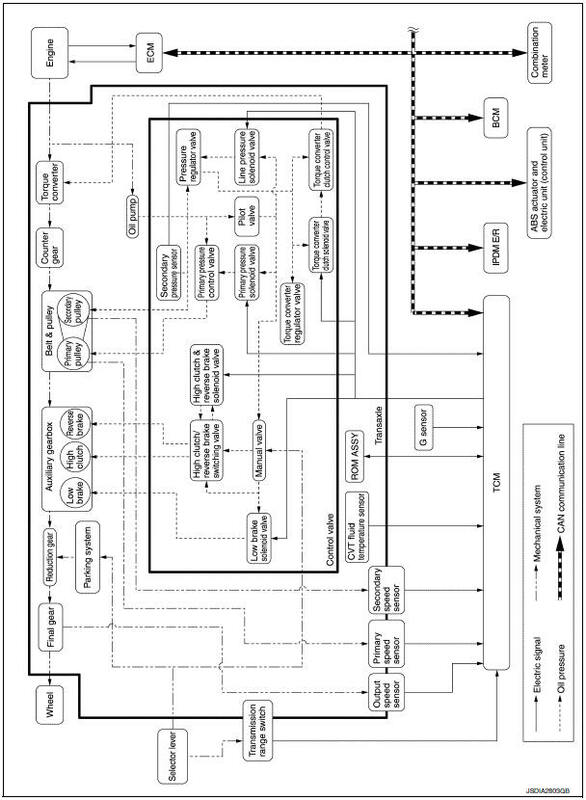 The diagnosis information can be checked using a diagnosis tool (GST: Generic Scan Tool). The GST is connected to the diagnosis connector on the vehicle and communicates with the on-board control units to perform diagnosis. The diagnosis connector is the same as for CONSULT. Refer to GI-47, "Description".